The last 11,000km brought me through various kinds of roads – good roads, bad roads, dirt roads, potholes, gravel, off road, bumpy roads, grass, and almost every other variety of bad Asian road. Also together with the fall in northern Laos, there are several stuff I had planned to replace when I’m back in Singapore. 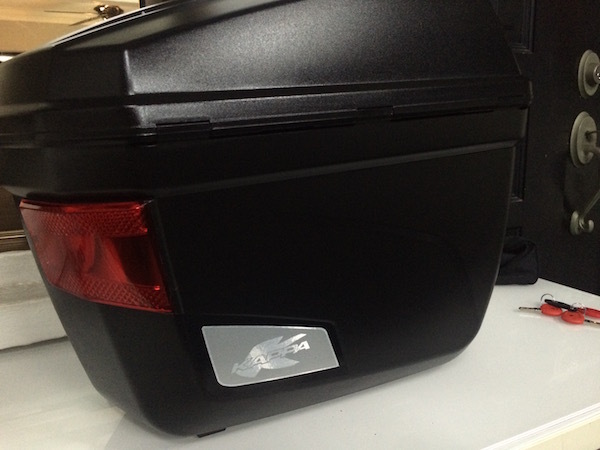 I loved my Givi E22N panniers. They have ample storage for day-to-day use, yet slim enough to maintain lane splitting abilities. I’ve reviewed them earlier here. But it took just 1 fall in northern Laos to break the right side of the case. So now that I’m back in Singapore, I went searching for its replacement. 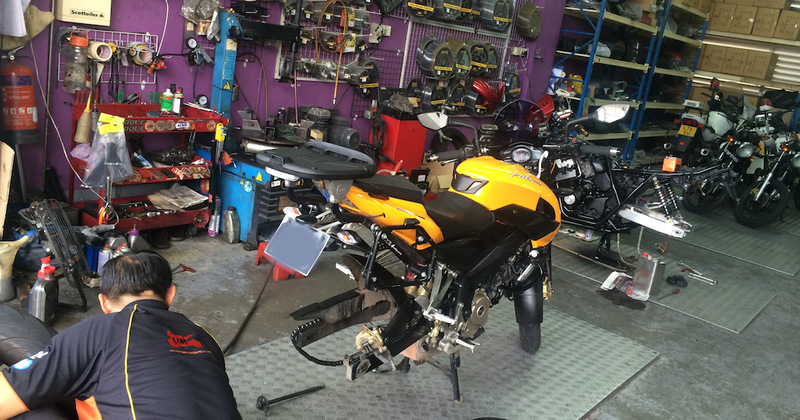 The Kappa K22N’s – Kappa’s version of the Givi E22N. 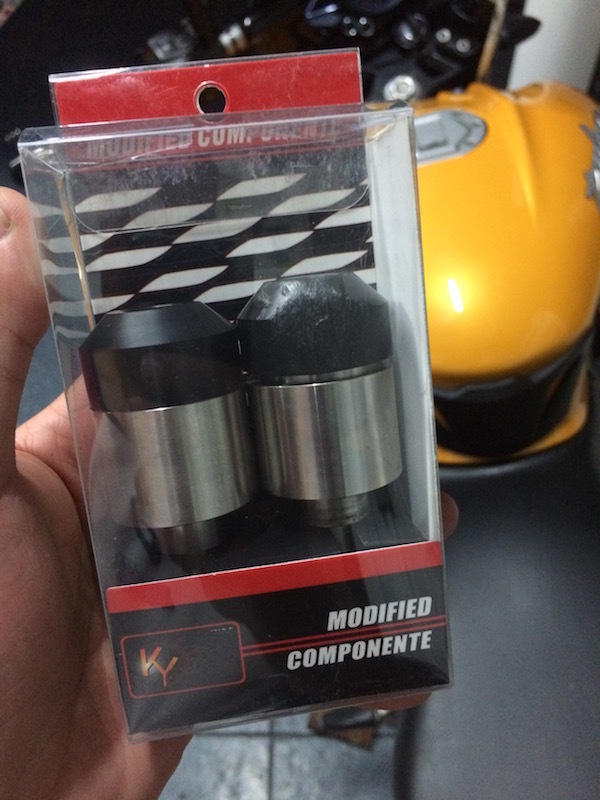 Lim Ah Boy in Kelantan lane sells the Kappa K22N’s instead ($120). They’re slightly cheaper than the Givi’s I got, but are identical in every aspect other than the label on the side of the case. I suspect the locks on the case are made by Givi – it even has a “GVxxxxx”, Givi’s monolock system, engraved on it! And the keys are identical to Givi’s too! Due to the same fall, the right hand side of my handlebar balancer was badly scratched. The ones I had were aftermarket versions. So I got a pair of replacements from Lim Ah Boy for $20. I replaced only the right side, and still have 1 more brand new one – just in case I need it in the future. Anyway, it was time for new tires, and Unique Motorsports was running a promotion on the Pirelli Angel CiTy. A set of 110/70R17 front and 140/70/R17 rear went for $155. 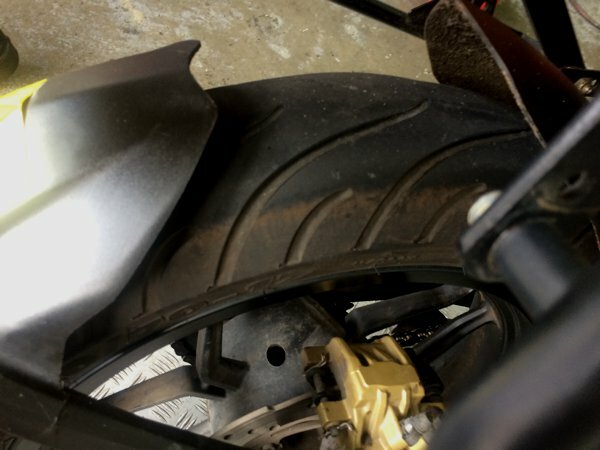 The Pirelli Angel CiTy or Angel CT was designed by Pirelli specifically for the Asian “small bikes” market – targeting at bikes around the 150-300cc range – who wants to upgrade from the OEM tires. The thread pattern and tire design was inspired by and derived from the Pirelli Angel GT, renown for it’s touring capabilities. But the Angel GT’s were built for bigger bikes. The Angel CT was also specifically designed for the “Asian roads” – being able to take the abuses of the various uneven roads that rural Asia has to offer. Pirelli promises a robust carcass design, high durability on any kind of road, and extended mileage on the Angel CT. 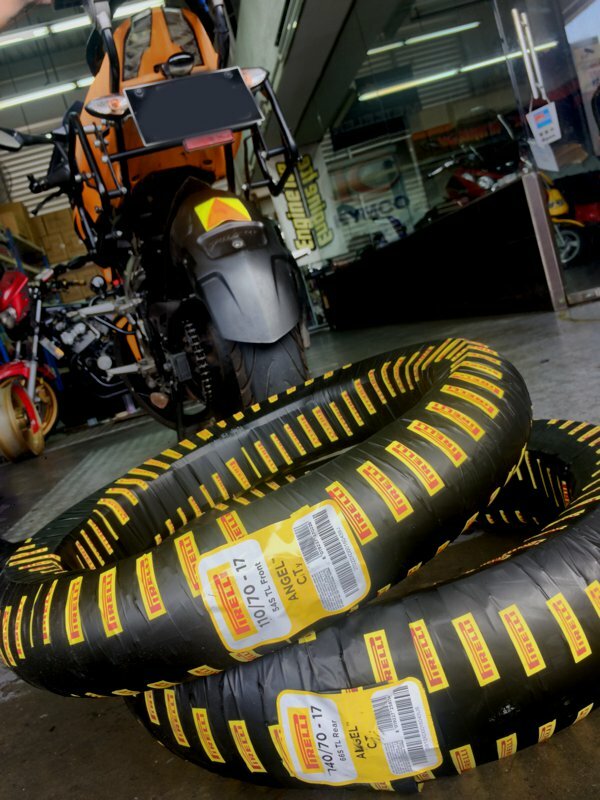 Think of the Pirelli Angel CT as a set of touring tires for the smaller (up to 300cc) bikes – perfect for my Pulsar 200NS! Brand new set of Pirelli Angel CT waiting for installation. I was quite pleased with Unique Motorsport’s installation as he took his time to unwrap the tires instead of using a razor to slice through the packaging. Balancing the wheel with new tires before installation onto the bike. My set of 3 spark plugs (yes – 3 plugs on a SINGLE cylinder) have served me well over the last 11,000km. I’ve brought a set of spares for the trip which I didn’t get to use. So I dropped by Universal Motors to get them replaced. The nice people at UM didn’t charge me for labour to replace the plugs as they remembered that I purchased the set from them (which typically includes the cost of installation) before I started my trip. 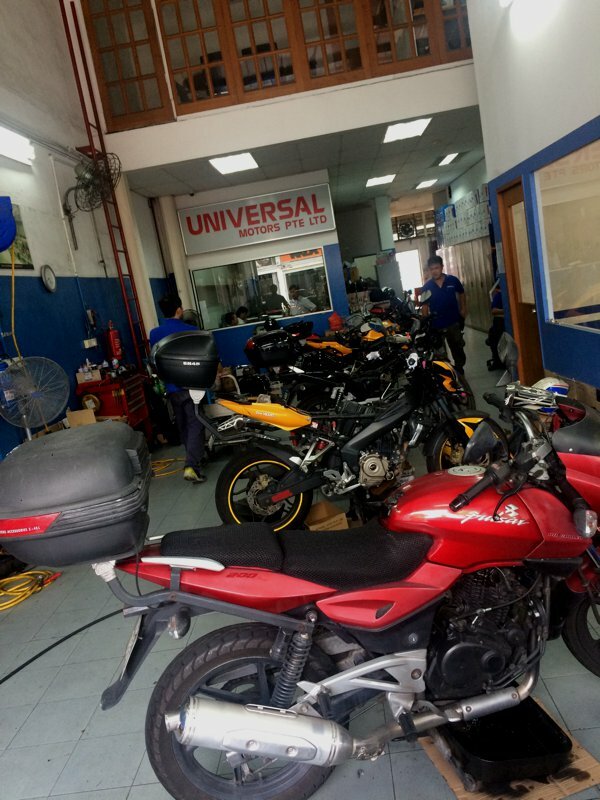 My Pulsar 200NS getting some love at the home of Pulsars in Singapore – Universal Motors. And while fixing up my spark plugs, the UM mechanic noticed the right side slave plug’s rubber grommet is worn. Got that replaced too. Also, my right hand side panel broke at the bottom mount, and will rattle when the bike’s in motion. Replaced for about $32, I think. 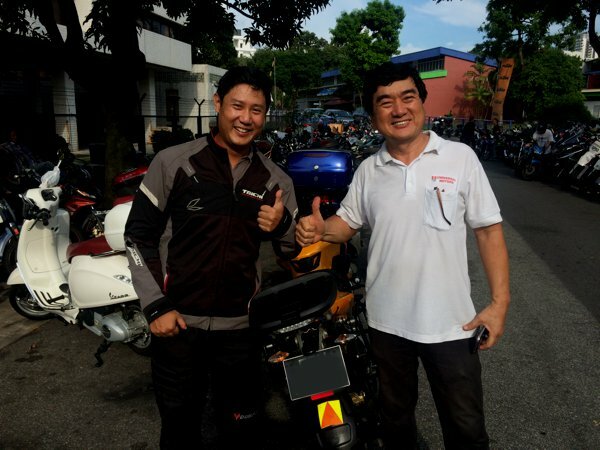 sgBikerBoy and Michael – the big boss of Universal Motors. Apparently, Michael was aware of my recent Asia tour as the Bajaj HQ guys who happened to be at the Phnom Penh branch whatsapp’ed him about this crazy Singaporean who rode up to Cambodia. Woah! What a small world! So, would you recommend hard panniers or soft panniers for long trips? I think most people think that hard panniers are better as they can be locked. But as you have found out, hard panniers can break whereas soft panniers won’t. If they tear, they can be sewn up whereas patching broken hard panniers is much harder. What do you think? Well, I like the idea of being able to lock the stuff up and then head out to explore the surroundings. So hard cases suit me better. That said, I do have soft side bags which I found to work well for many situations. But I wished I had some supporting structure to prevent bag sag – which the hard case mounting frame now provide. I was sort of prepared for the hard case to rip. That’s why I carried the tie down straps – to keep the broken case closed. Previous Previous post: Happy 51st Birthday Singapore! Next Next post: THANK YOU fellow biker FD8352!! 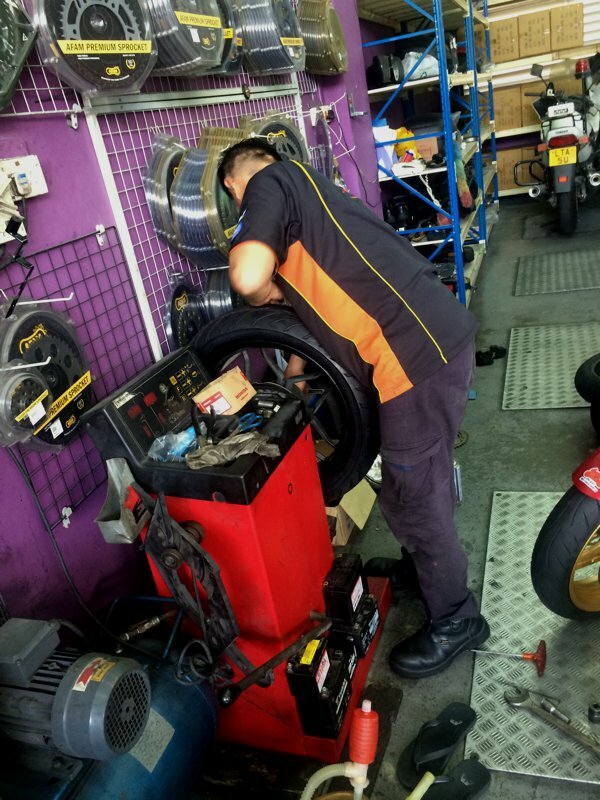 ← The sgBikerBoy 2016 Trip – Day 20 ← THANK YOU fellow biker FD8352! !